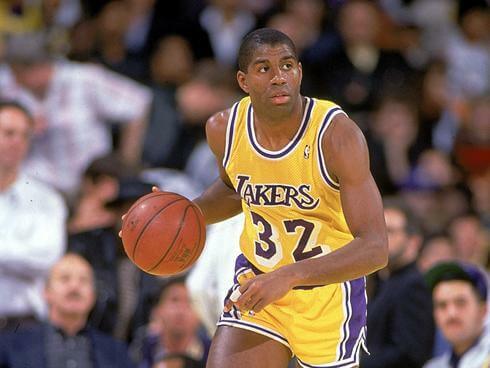 In the 1979 NBA draft, Los Angeles selected 6-foot, 9-inch point guard Magic Johnson from Michigan State with the first overall pick. It took Johnson’s teammates time to acclimate themselves to his passing ability, as his “no-look” passes often caught them unaware. Once they adjusted, his passing became a key part of Los Angeles’ offense. The Lakers won 60 games in Johnson’s rookie year, and defeated the Philadelphia 76ers in six games in the 1980 NBA Finals. Johnson won the series Finals MVP award, after starting at center for the injured Abdul-Jabbar in game six, and tallying 42 points, 15 rebounds, and seven assists. The team fell off in the 1980 – 1981 season, though, as the Lakers lost Johnson for most of the season to a knee injury. The team turned in a 54–28 record and finished second behind the Phoenix Suns in the Pacific Division. The Rockets, led by Moses Malone, defeated Los Angeles in the first round of the playoffs.